Rabbi Levinger, among founders of modern Hevron Jewish community, is hospitalized in critical condition. 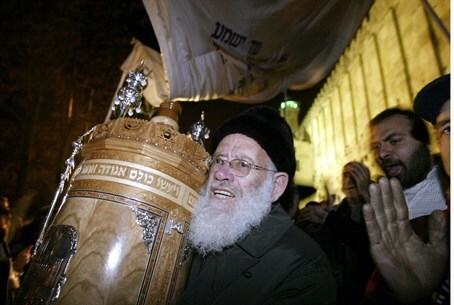 Prominent religious Zionist Rabbi Moshe Levinger, one of the founders of the Gush Emunim movement advancing the Jewish presence in Judea and Samaria, continues to be in serious condition after being hospitalized in the Shaare Tzedek Hospital in Jerusalem. The rabbi, who is over 79-years-old, is one of the founders of the modern-day Jewish community in Hevron, the City of the Patriarchs, whose ancient Jewish community was wiped out during the 1929 Hevron Massacre by local Arabs. He is also one of the founders and a former leader of the Yesha Council, which represents the Jews of Judea and Samaria. Rabbi Levinger's son Shlomo Levinger told Arutz Sheva that his father was hospitalized in recent days after suffering an epileptic seizure, and that he is also suffering from pneumonia. The family is asking the public to pray for the full recovery of Rabbi Moshe Ben Tirtze. Rabbi Levinger's wide-ranging activities with Gush Emunim have led many to view him as one of the founding figures in the movement of establishing Jewish communities in Judea and Samaria, and particularly in Hevron. He was among those who signed on an announcement in April 1968 calling families and singles to repopulate the Jewish community in Hevron. On Pesach (Passover) of 1968, he led a group of Jews in holding a traditional seder meal at the Park Hotel in Hevron, and after the holiday he announced that they would stay in the city. For three years the group lived in the military administration building in Hevron until Kiryat Arba was established adjacent to the ancient city, at which point they moved there. After the 1973 Yom Kippur War, he represented the Jews who moved into Sebastia in Samaria in opposition to the government of then-Prime Minister Yitzhak Rabin. Rabbi Levinger is married to Miriam, with whom he has 11 children. In 2013 he won the Moskowitz Prize for Zionism.